According to Entrepreneur, having a disorganized inbox is one of the top five ways that a worker can waste time. 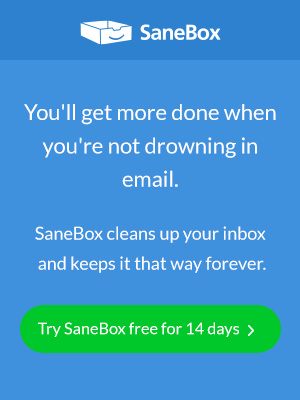 Fortunately, with tools like SaneBox, you can organize your email with minimal effort. In “Getting Things Done: The Art of Stress-Free Productivity,” David Allen outlines his method of clearing both physical and digital inboxes. The most important thing, according to Allen, is to find a method of organization that works for you—and to stick to it. It might mean quickly deciding what can be stored for later, what must be responded to immediately, what to delete, and what to hold on to for reference. With practice, you will find methods that save you heaps of time over the long run—a few seconds now might be worth hours later. How many emails do you receive, barely take a look at, then either archive or delete? If you’re anything like me, it’s a lot. If we all read every word of every email we received, we wouldn’t have time for anything else. As a freelancer, you have to reach out to new clients. Sometimes those clients are extremely busy. Sometimes they miss your emails. That’s why a proper strategy for following up is essential. I used to be afraid of following up—I thought that people would be bothered by me reaching out for a second or third time, but, if done respectfully, following up can not only land you more clients and more work, it can actually build a better relationship between you and your clients. After getting over my fear of being a bother to people, once I started employing a strategy of following up in ways that are respectful of people’s time, I’ve actually had many people thank me for following up—some of them admitting that they needed a reminder in order to spur them into action. But, please note: There is a fine line between an appropriate strategy for following up and just being annoying. If someone says no, they mean no. Either pitch them something completely different or move on to the next client. But if they simply haven’t responded—or said they would get back to you in a week and two or three have gone by, then it’s probably the perfect time for a friendly email follow-up. And, although the topic of this article is email, you can’t ignore the fact that following up by phone is sometimes appropriate. You have to employ a strategy that utilizes both, and you have to feel out your clients or prospective clients to know what works best. Using job searching as an example, Human Resources expert Lee Miller explains that sometimes follow-ups are more important than interviews. The same can be said for a freelancer trying to land new clients. Set automated email reminders to follow up, stick a post-it on your keyboard at night so that the first thing you do in the morning is send an important email, or do whatever it is that works for you—but make sure you do it. Things will fall through the cracks, but you can make sure fewer things fall through—saving yourself time and earning you more money. Don’t be the person who sends 45-paragraph emails that no one will read. Not only is this practice a huge waste of your own time, it’s also a waste of time for the people you are attempting to communicate with. One of the most important rules for writing is to be concise. This applies especially to email—a medium that is inherently based on writing and speed. There are numerous resources you can use to work on writing more concisely, including the classic “The Elements of Style” by William Strunk and E.B. White or this useful piece from the University of North Carolina Writing Center. Take a little time to work on these writing skills now, and it will save you tons of effort in the long-run; not only will you write more effectively, but you’ll receive better responses and your clients will appreciate that you respect their valuable time. 1. Take a look at some of the emails you sent recently. Are they too long? Too short? Are they full of grammatical errors? Find something you can improve and set yourself to learning how to improve it. 2. Examine your inbox. Are there 14,000 unread messages? You probably don’t have time to manually organize your inbox now, but there are tools to do it for you and to keep it organized in the future. 3. Do you have a system in place for reminding yourself to follow up with people? If not, why not? What are you doing to make sure that all of your projects are progressing toward some sort of conclusion and not stalling? 4. Think about your freelance business. Are there certain types of emails that you can automate? Do you have up-to-date email lists and do you make contact with potential clients as often as you should? 5. Are you subscribed to so many email lists that your inbox is filled with stuff you never plan to read? Start unsubscribing. Remain only on the lists that are absolutely essential for you. John Arthur is a freelance writer and editor, as well as a musician. You can check out his band, The Deafening Colors, at www.thedeafeningcolors.com. He is guest posting for AND CO on this article.